The prime minister referred to the China-U.S. trade war and the pending Brexit divorce of Britain and Europe, as well as the threat of climate change and the economic upheaval of losing jobs to artificial intelligence. 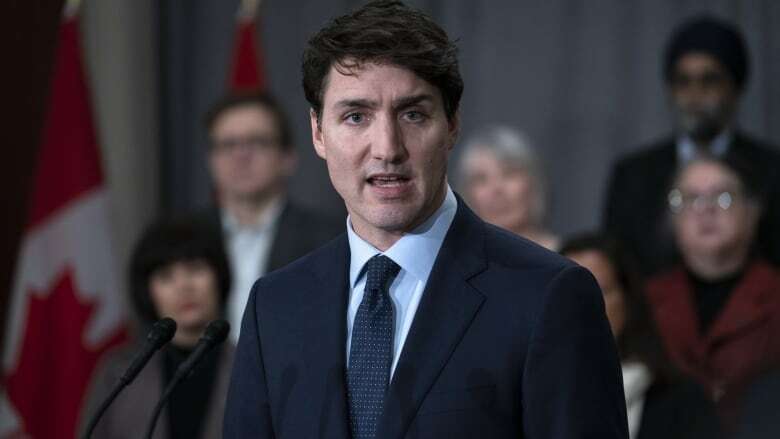 But Trudeau skirted mention of Canada's personal list of international woes, including its plummeting relations with China after the RCMP arrested Huawei executive Meng Wanzhou on Dec. 1 at the behest of the United States. Days later, China detained Michael Kovrig, a Canadian diplomat on leave, and Michael Spavor, an entrepreneur, on vague allegations of "engaging in activities that endanger the national security." Last week, a third imprisoned Canadian, Robert Lloyd Schellenberg, received an upgraded sentence to a previous drug smuggling conviction from a Chinese court — death. "People across the country — and really, around the world — are anxious about what they see happening on the news, and in their communities," Trudeau said Sunday at the opening of a two-day caucus retreat for Liberal MPs on Parliament Hill. "Climate change is an increasingly dire threat, with floods and fires destroying whole towns at a blistering pace. The world's two largest economies are at odds, and our founding European nations are going through unprecedented political turmoil." The prime minister repeated to his caucus the narrative his cabinet has been pushing for the past three years: It's all about the economy. He took the opportunity to tout the Liberal record, and slam the Conservatives at the same time. Trudeau said the Tories don't know how to fight for middle-class families, saying they voted against key economic policies like changes to the Canada Pension Plan and the child tax benefit. "Make no mistake: The Conservatives pretend to be 'for the people,' but that couldn't be further from the truth. This is still very much the party of Stephen Harper," Trudeau said, adding their record shows it's "All to protect the wealthy, the well-connected and the powerful." He used Sunday's speech to sharpen what will be his core campaign message when Canadians are expected to go the polls in October in the next federal election. Trudeau took several partisan shots at the Conservatives, saying they have no plan for tackling climate change and the economy while citing Liberal gains in lowering taxes and unemployment. He said Canadians voted for change in 2015, and that the Liberals still represent that hope. "This year we're going to offer that hopeful vision of Canada once again," he said, branding the opposition as a party of wedge politics rooted in the ideas of former leader Harper. "It's all the same — wedge issues, cuts to services and the will to look backwards. They'll never change." Trudeau said the advances his government has made on trade has opened up Canada to the world, proving that it is an "ideal place" to do business. But the Canadian economy does face its challenges. There's the uncertainty around some significant unfinished economic business with the Trump administration in Washington, D.C., that cuts to the core of Canada's economic future. This includes ratifying a newly renegotiated North American free trade agreement, and getting rid of punishing U.S. sanctions on Canadian steel and aluminum. There are also international headaches could make it more difficult for the Trudeau Liberals to keep the focus on domestic concerns as they navigate their way through an election year. Canada is also in the midst of a falling out with Saudi Arabia, which started in August when the country's volatile Crown Prince Mohammed bin Salman was bent out of shape by a tweet from Foreign Affairs Minister Chrystia Freeland calling for the release of political prisoners. Saudi Arabia expelled Canada's ambassador, froze investment and recalled its foreign university students.